Illegal logging activity in the Amazon is exposing the final few hundred people on Earth left untouched by civilization. 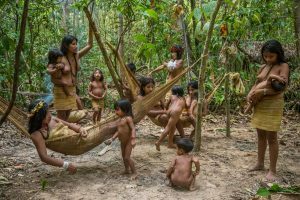 The survival of the estimated 50 to 100 isolated or “uncontacted” tribes across the Amazon Basin is in jeopardy, reports National Geographic. Confined to a shrinking jungle core, the nomadic Awá hunter-gatherers are especially vulnerable. 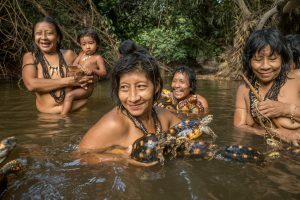 Survival International called the Awá “Earth’s most threatened tribe” in 2012. Wallace visited with contacted members of the 600-member Awá tribe and a neighboring, more modernized tribe called the Guajajara, who informed him about the 100 or so uncontacted Awá, who still live hidden deep in the jungle as nomadic hunter-gatherers. An uncontacted Awá camp. The uncontacted Awá still hunt with bows and arrows, gather wild honey, fruits an nuts, and rely entirely on the bounty of the primal forest. The Guajajara have taken it upon themselves to be the protectors of“the isolated ones,” believing their own survival to be dependent upon the Awá. 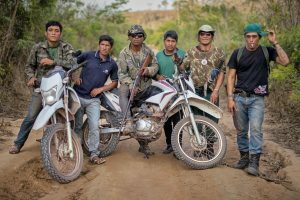 “They’ve set logging trucks ablaze, seized weapons and chain saws, and sent irate loggers packing,” Wallace writes. “Who’s going to fight for the isolated ones, if not us?” a Forest Guardian named Tainaky told Wallace the night before a patrol. He pulled out a map of the protected Arariboia territory. “The loggers are entering all around the perimeter of the indigenous land,” he said. Trouble for the Awa began in the 1970s and ’80s when a railroad split their territory in half, which led to cattle ranches, factories, and entire cities growing up around them. 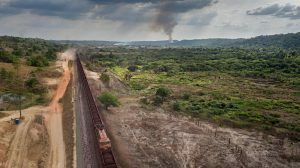 Trains full of iron ore, from the world’s largest open-pit iron mine, cut through Awá land en route to China. Many of the Awá are descendants of those who fled to escape enslavement and devastating epidemics during the rubber boom more than a century ago, says another National Geographic journalist Chris Fagan. The number of contact events will increase if Peru continues to promote policies to open up more of the forest to exploitation, Fagan says. 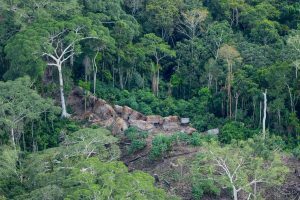 The Interethnic Association for the Development of the Peruvian Rainforest is proposing a more than 34,000-square-mile protected corridor for tribes in isolation and initial contact. The estimated 5000 uncontacted people of the Amazon represent almost all uncontacted people left on the planet. 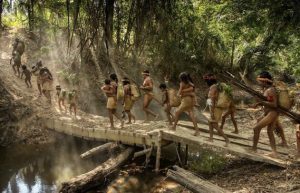 The only so-called “uncontacted” tribes remaining outside the Amazon today are a few hundred people in Paraguay’s Chaco scrub forest, the Andaman Islands in the Indian Ocean, and in western New Guinea, Indonesia. “The numbers may seem small, but indigenous-rights advocates say there is something much larger at stake: the preservation of the last vestiges of a way of life that has all but disappeared from the planet, one that has survived apart from our industrial economy,” Wallace writes. For more information on how you can help, visit Survival International’s website.